In high school, when we would cheer for our sports teams, it felt like I was the smallest person in the cheering section with the loudest voice. FACT: The size of the body really doesn’t have anything to do with the size of the voice. Is that the same for a church body? 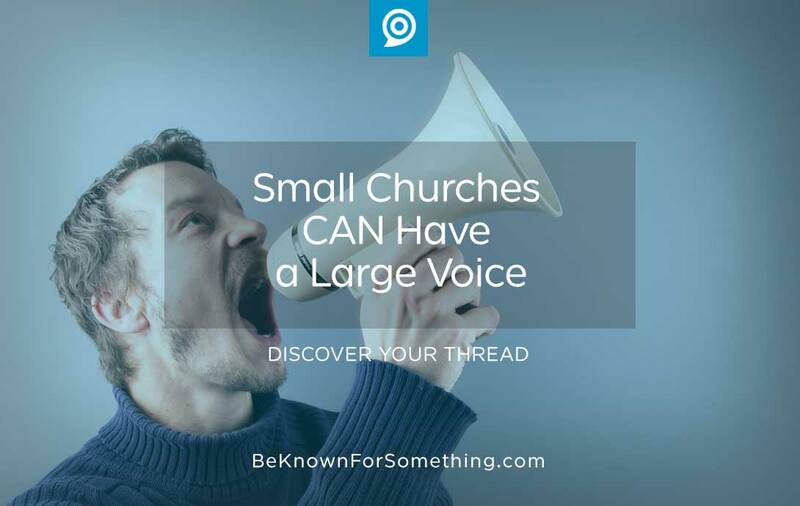 Can a small church have a loud voice? Absolutely! The size of your congregation shouldn’t correspond with the loudness of your message. We all have the Gospel to share, and God empowers it to be heard by using us. Unify Your Thread. If the general theme of your messaging is similar every time you speak (using similar keywords), people will take notice more than they would if you have something different to say all the time. This doesn’t mean monotonous repetition of the same thing. Be creative and have different stories connect to the same communication thread. Search engines will also love you and deliver your website when people are searching for your thread. Singing in unison always reaches farther and feels louder than singing in harmony. Simplify Your Website. Most small church websites are more complex than large church websites. Stop trying to say more since people want to read less. Instead simplify your website organization and streamline your pages to deliver just the facts that someone is looking for. Use video and pictures to speak thousands of words. Ensure your service times, map links, and brand promise are all on the home page. And a quick way to get to upcoming events, visitor page, and about page. Create Your Volunteer Ministry. Get some help from the congregation! Good ministry is helping others do great things in unity. Look to see who has the largest social media presence and ask them to help your church have it too. Get together and dream big. Keep expanding the team while always maintaining a similar voice as it gets louder. Automate Your Messaging. Use programs like Hootsuite for planning and posting social media. Consider marketing automation software (like Infusionsoft, Sharpspring, Hubspot, etc.) for creating campaigns to reach your community. FACT: Voices are heard more when they’re speaking the language of the community. Get to know your community on an intimate basis. The more you speak solutions, benefits, and paths to goals to meet the community’s needs, the more your voice will feel louder.